Be the first to share your favorite memory, photo or story of Laverne. This memorial page is dedicated for family, friends and future generations to celebrate the life of their loved one. 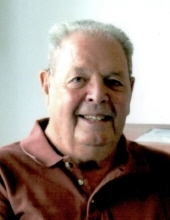 William Laverne Weisskopf, age 85 of rural Ladora, passed away on Saturday, March 16, 2019 at his home with his family by his side and under the care of Grinnell Regional Hospice. A memorial service will be held at 10:30 a.m. on Thursday, March 21, 2019 at the Victor United Methodist Church with Rev. Jim Davis officiating. A luncheon will follow the service. Visitation will begin at 2:00 p.m. on Wednesday at the Smith Funeral Home in Victor and his family will receive friends from 4:00 p.m. until 7:00 p.m. In lieu of flowers, memorials may be designated to Camp Courageous or Grinnell Regional Hospice, mailed in care of the Smith Funeral Home, PO Box 485, Victor, Iowa 52347. Memories and condolences may be shared with his family online at www.smithfh.com. Laverne was born on December 27, 1933 in Lincoln Township to William John Weisskopf and Perah (McClenathan) Weisskopf. He was raised on the family farm and graduated from Victor High School in 1952. Laverne began working at the age of 15, shelling corn and baling hay for Don Rohrer. He was united in marriage to Nancy Lee Slaymaker on December 12, 1953. They were blessed with three children, Rhonda, Paul and Christy. In 1956, they moved to the family farm where he was raised and farmed until 1995 after falling off the dryer bin and forced his retirement. Following his retirement, he helped Dan Weisskopf and Paul Kuesel farm. He also worked at Smith Funeral Home in Victor for ten years. In the 1970’s, Laverne was very active in Civil Defense, and the Iowa County Radio Club. Laverne and Nancy loved to square dance. Laverne loved hunting and fishing. He took many trips to Canada with his son, Paul and his buddies from Minnesota. After retirement, Laverne started baking cookies and bars. He would take them to friends and church for coffee time. Laverne’s memory is cherished by his wife of 65 years, Nancy Weisskopf of rural Ladora; daughter, Rhonda (Harry) Healey of Cedar Rapids; son, Paul (Pam) Weisskopf of Des Moines; three grandchildren, Luke (Lindsay) Healey, Molly (Jay) Glaspie, and Nicole (Blake) Wilson; one great granddaughter, Perah; two step great grandchildren, Janelle and JJ Glaspie; one step great great grandson, Jaxson Glaspie; and many nieces, nephews, extended Minnesota family, and many many friends. He was preceded in death by his parents; sister, Perah Read; brother, Merlin Weisskopf; daughter, Christy; and granddaughter, Katherine “Katie” Weisskopf. To send flowers or a remembrance gift to the family of Laverne Weisskopf, please visit our Tribute Store. "Email Address" would like to share the life celebration of Laverne Weisskopf. Click on the "link" to go to share a favorite memory or leave a condolence message for the family.